AS THE reality of Brexit moves ever closer, concern continues to grow within the trade union movement about the implications for employee rights. With many of the rights and protections afforded to workers in this country deriving from EU legislation, questions arise about what will change once the UK is no longer bound by European directives. Little comfort is gained from Tory government claims that its European Union (Withdrawal) Bill will seamlessly repeal EU laws and replace them with new versions which will become incorporated into UK statute. Recent experience of other prominent attempts to simultaneously “repeal and replace” major pieces of legislation suggests that the loss of binding EU commitments will place many aspects of employment law at risk, subject to the political whims of government. Post-Brexit, important gains in employee rights — such as health and safety protections, rights for temporary workers and paid maternity and paternity leave — are ripe for attack by right-wing politicians. Britain has not always been at the forefront of initiatives to improve employment protections, particularly in comparison with the rest of Europe, so it is difficult to see an emboldened political right suddenly changing tack once EU safeguards are removed. Britain has long had some of the most obstructive anti-trade union laws in Europe, and the obstacles facing unions grew even more daunting with the Tory government’s 2016 Trade Union Reform Act. This highly restrictive Act, disingenuously portrayed by the right as a progressive piece of reform, is a politically motivated attack on the ability of employees to campaign through their unions. In the context of Brexit and the Westminster government’s attack on trade unions through the Trade Union Act, it is essential that unions organise and that members are fully informed and engaged in the work of their own union. The Educational Institute of Scotland will shortly launch a ballot on the renewal of its political fund — another restrictive aspect of British trade union law that obliges all unions which wish to campaign, on any political issue, to operate a distinct fund for the purpose and to ballot on its retention every 10 years. Given the current political climate, union campaigning is perhaps more important than at any time this century so it is vital that the EIS, and other unions, maintain this political campaigning role. One slightly unexpected positive of the government’s Trade Union Act is that it has placed a spotlight on the value of unions, led by an active membership base, in protecting employee rights. Although the government’s intent was to weaken union effectiveness, the legislation has provided a jolt and reminded members of the importance of being active in their union. A key issue for the movement must be the rights of people from other EU countries who have chosen to come to live and work in Britain. These continue to be at risk as a result of Brexit, despite some attempts to assuage concerns on this issue. It is deeply distressing that many people who have chosen to make Britain their home, and who have made a positive contribution to many aspects of society, are being treated as pawns in political posturing and Brexit-induced haggling. The fact is that many of these workers are fulfilling vital roles in our society and in our economy, including in our public services such as health and education, and do not deserve to be treated in this way by our government and demonised as they are by many in the tabloid media. From the perspective of Scotland, migration is essential to the future economic prosperity of the country. This year’s Trade Union Congress provides an important forum for unions and members to work together to stand up for employee rights, and to send a message that we will continue to fight for our members in the run-up to Brexit and beyond. Larry Flanagan is general secretary of Scotland’s largest teaching union, the Educational Institute of Scotland (EIS). After having backed the Tories against Labour over Brexit, and siding with David Davis against the foreign menace, it must have come hard for the loyal, patriotic and thoroughly nationalist Morning Star (second only to the Daily Mail in anti-European fervour), to have to publish some pieces opposing Brexit. But the Morning Star’s difficulty is that, since the collapse of the Soviet Union, it depends upon the union bureaucracy to keep afloat: and that means publishing what they say, even when it goes against the patriotic stance of the Morning Star‘s political masters, the Communist Party of Britain, which hates Europe and all things European. So, in Saturday’s Morning Star there were four pieces by union leaders (Horace Trubridge of the MU, Larry Flanagan of the EIS, Manuel Cortes of the TSSA, and Gail Cartmail of Unite), all of which oppose Brexit. This urban myth has been perpetuated by left-reformist anti-Europeans and by Tory anti-interventionists for the last forty years. But it’s wrong, at least according Article 345 of the Treaty of the Functioning of the EU of 1958, which states: ‘The Treaties shall in no way prejudice the rules in Member States governing the system of property ownership.’ This Article remains in force and makes a nonsense of the claim that existing EU legislation prohibits the kind of nationalisation, or other economic intervention, being advocated by Jeremy Corbyn. But even if it did, is anyone seriously suggesting that if Corbyn gets elected on a manifesto that includes public ownership, he would not be able to implement it if we remained in the EU? Nonsense. As the pro-Brexit right continually reminded us during the referendum campaign, Britain is the fifth largest economy in the world, and (unlike Greece) would have little difficulty in forcing the EU to accept a Corbyn government’s right to introduce such relatively minor reforms as taking key industries and services into public ownership. Anyone who’s ever taken a train in France or Germany knows this. As the reactionary, anti-working class and essentially racist nature of Brexit becomes more and more obvious, I cannot believe that anyone who calls themselves a socialist, is not appalled. It’s probably too much to ask the self-absorbed, self-deluded, ultra-sectarian groups that comprise the pro-Brexit “left” to simply admit that you’ve got it wrong, and reverse your disastrous policy on EU membership. That kind of intellectual honesty is not part of your culture. But I think internationalists and anti-racists do have the right to demand that you make it clear that you support free movement, oppose a “hard” Brexit and support the maximum possible degree of co-operation and integration between British and European people (and, in particular, workers via their organisations) in or out of the EU. Theresa May admitted the Home Office made an “unfortunate error” when it mistakenly sent up to 100 letters to EU nationals living in the UK ordering them to leave the country or face deportation. The prime minister was forced into the statement after it emerged that a Finnish academic working in London had highlighted the warning letter she had received, which told her to leave the UK or risk being detained. Although Eva Johanna Holmberg has lived in the UK with her British husband for most of the last decade, the correspondence from the Home Office said that if she did not leave the country of her own accord the department would give “directions for [her] removal”. It added that she was “a person liable to be detained under the Immigration Act”. Her story was rapidly picked up on social media, but after the Guardian asked the Home Office for clarification of her situation the department immediately backtracked and said the letter had been sent by mistake. I am an EU immigrant who has lived in the UK for the last 27 years. Having met a British guy (now my husband) during my gap year in 85/86, I had returned to my native Germany to complete my training there. I returned in 1990, newly qualified. I applied for three jobs, had three job offers and have been in employment ever since. It takes a while to become familiar with a new country and a new culture, and to feel fully at home, but I have always felt part of British life and British people. Britain seemed so diverse and multi- cultural, tolerant and vibrant compared to the Germany I remembered from my childhood. I never really felt different or “foreign”, but instead felt that I belonged. One disadvantage of being an EU citizen was not being able to vote in general elections (or certain referendums), but that did not seem to matter much. We had two children and, due to circumstances, my husband stayed at home with them and I continued to work and be the breadwinner. We have lived in our town for 20 years and are very much part of the community. All that changed with the EU referendum last year. From one day to the next I was no longer simply part of the great collective that makes up British society, but I had become a foreigner, an outsider, somebody who – somehow – was part of the problems that ail this country. Comments like “the country is full” and “immigrants put a strain on our services” are easily heard in conversation. Now, I am used to anti-immigration rhetoric from the right-wing press and right-wing parties, but more recently that rhetoric seems to be seeping into Labour’s language too. I understand that Labour’s position would be to unilaterally guarantee full rights to EU citizens who are already settled in this country, and of course I welcome that position. However, there is also increasing talk about EU citizens being a threat to British workers, and that immigration should be curbed to only allow in those immigrants who are of benefit to the British economy. Whichever way I try to look at it, that makes us second class citizens, commodities even, which are useful to bolster British economy when necessary, but can be rejected when no longer needed. Jeremy Corbyn was recently asked by Andrew Marr what would happen to (for example) Polish plumbers, if they were no longer required. Would they be sent back to Poland? Corbyn was careful to avoid answering that question. The warm and welcoming Britain I fell in love with (well, after my husband, that is) seems to be disappearing. If I am only welcome because of my economic value, I am not welcome at all. I am simply viewed as a resource, not a human being. Now I feel that I have to justify my existence here by being able to demonstrate my economic worth. Speak to other immigrants, and you will probably very soon hear them say something like “I have been here for X number of years and I have always worked”. The perception that immigrants come to take from Britain and not give anything back, has filtered deep into the psyche of the nation, so we feel the need to demonstrate that we are different! If I had stayed at home with my children instead of my husband, my economic value in the eyes of the government and politicians would be much reduced. If my industry no longer needed workers (not likely any time soon – I work for the NHS! ), would I still be welcome to stay? Friends are quick to tell me that “I will be OK” and “surely I will be allowed to stay”, but well-meaning as they are, they really miss the point. “Being allowed to stay” is really a far cry from feeling a fully welcome and accepted member of society. Being left with uncertainty and anxiety about your future in the country you have invested your entire adult years in and which you have made your home, is cruel and shows a disregard by the government for the people it claims are “valuable members of society who contribute much to British life”. Britain no longer feels like a safe place where I belong and which I can call my home. It still is the place where I have chosen to live, yes, but for the first time in 27 years we are entertaining the idea of leaving. Having been a Labour voter (in local elections) for 27 years and having become a Labour member following the 2015 election, I am urging Labour, and its supporters – including the Corbyn left – to keep on the straight and narrow during these turbulent times and to not stray down the path of appeasing anti-immigrant sentiments – even when they are dressed up in left-wing sounding language about protecting workers in Britain. I am watching Corbyn backtrack on this issue with some concern – I hope my continued support for Labour and Corbyn will not be in vain. Sarah Champion would not have been wrong to have raised the question of the likely connection between sexual abusers’ cultural (not racial, or even religious) backgrounds and their attitudes towards women and girls. Others have done this without making any concessions to racism. What she was – unforgivably – wrong to have done, was to have written about such a sensitive matter in the Sun, a rag with a long and well-known record of taking a (shall we say) cavalier attitude to racism. Indeed, all this could well have been a set-up by the Sun. They wrote the headline and quite possibly the line which made it specific about “white girls”. Champion’s office had the Sun‘s final version of the article before it was published, and, of course, she could have objected to this but either didn’t bother checking it or (more likely) was flattered to be published and thought it would raise her profile. Even so the outcry, at first, was not that great. It looked like Champion was going to survive it. According to today’s Guardian, “the Labour leader’s office appeared to back Champion until yesterday lunchtime, when positive emails from her office to the Sun in the aftermath of her article’s publication were highlighted by the newspaper.” By and large Corbyn supporters online had been quiet about the issue. Even the SWP were not really kicking off about it. One day soon, if Philip Hammond and Liam Fox are right, we will be back in charge of immigration. 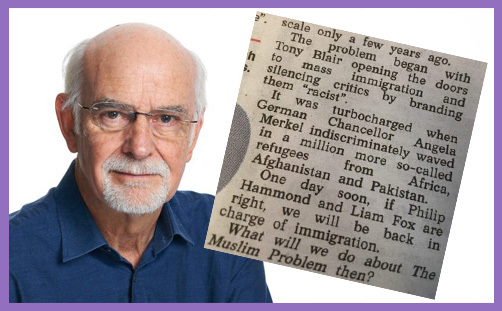 What will we do about The Muslim Problem then? Not surprisingly this caused outrage and the Corbyn team, quite rightly, wanted to respond but Sarah Champion’s article was the elephant in the room, inhibiting the Labour leadership from making an immediate, outspoken response. All the evidence (including her own record as shadow equalities minister) suggests she’s an idiot rather than a racist. But that’s no excuse. She had to go. As the UK-EU negotiations on Brexit begin, the political landscape in Britain is in flux. The general election result was widely interpreted as a riposte to the Tories’ push for a hard Brexit. Now senior Tory critics of a hard Brexit, and indeed of Brexit per se, are becoming bolder. Some, for instance Broxtowe MP Anna Soubry, even advocate the maintenance of free movement from the EU. More senior Tories have hinted at that too. Meanwhile polls suggest public opinion is shifting. A new YouGov/Times poll says that 58 per cent of people believe that trading with the EU is a higher priority than controlling EU immigration. More voters now believe Britain was wrong to vote to leave than right: 45 to 44%. A Survation poll found that 55% favoured a “soft Brexit” with the UK remaining in the EU single market and customs union, while only 35% favoured a “hard Brexit”. Survation found that 48% favour a referendum on the final Brexit deal, while only 43% are opposed! All this is despite a lack of leadership from the Labour Party. Labour generally criticises the Tories from the left, i.e. from a more anti-Brexit position. It has rightly denounced the government’s concessions on the right of EU citizens to stay in Britain as “too little” — because as the campaign Another Europe is Possible and numerous migrants’ rights groups have explained, the offer is hedged round with all kinds of very bad limits. It’s “too late” because it should have been done a year ago, when Labour proposed it. More generally, however, Labour’s position is as clear as mud. With one, decisive exception: senior Labour spokespeople are very clear that they support an end to free movement from the EU. In other words, the position they have tied themselves to is to the right of that taken by Anna Soubry. Labour’s stance has no doubt been given encouragement by the Stalinist-origin types in Corbyn’s office who think that leaving the EU is a win for “fighting the monopolies” or whatever. But its origin is with the Labour right. As late as November 2016, Corbyn told the Sunday Mirror that Labour would vote in Parliament against triggering “Article 50” unless the government agreed to a “Brexit bottom line” that included staying in the single market — and thus accepting continued free movement. Then Tom Watson, who combines right-wing, Stalinist and pseudo pro-working class strands in his politics, intervened to say that Labour would put down amendments but vote for Article 50 regardless. Corbyn eventually deferred to Watson. Corbyn did not publicly endorse ending free movement until well into 2017, and then he did it in such an unclear way it looked very much like he was unhappy about it. Yet that then became Labour’s policy in the election. The leaders of the organised Labour left played a poor and even harmful role here. During the many months before and even after the referendum when Corbyn was holding the line on free movement, Momentum never once stated its support for this principle, let alone campaign to back Corbyn up. This was despite Momentum committees repeatedly taking a stand in favour of free movement, most recently in December 2016, when a motion on it passed with only a few votes against. Not long after the 23 June referendum, Momentum leader Jon Lansman made it clear that he favoured the left advocating an end to free movement. Did he stay quiet on the Momentum National Committee because he thought that position would lead to a breach with his allies, many of them young and enthusiastic about migrants’ rights? Whatever the backroom manoeuvring was, Momentum never carried its democratic mandate on this, even while that was in line with Corbyn. Labour Party members or their representatives have never been given a chance to vote on this issue. At last year’s Labour Party conference, no motions were submitted advocating an end to free movement – but motions were submitted opposing it, including from the national Young Labour committee and CLPs including Norwich South, Clive Lewis’ constituency. These motions originated with socialist activists on the left of Momentum. Unfortunately these motions were not prioritised for debate and the Labour right successfully counterposed the issue of refugee rights (which it seemed less keen on during the Blair years!) to having a discussion on free movement. The bulk of Labour members are very likely in favour of defending (and extending) free movement, and certainly vast majority of left-wing activists are. Yet this has not found expression in the hierarchy or public position of the party. Supporters of the hard right Progress group, which is making such a big deal of fighting a hard Brexit, like to say it will be possible to retain close ties to the EU while also limiting immigration. If the labour movement stands up and fights it can shift things further. It is time to stop the retreat — starting on the left. Labour and trade union activists should unapologetically argue: 1. That leaving the single market will make workers in Britain “poorer and less secure”. We should oppose it. Like it or not, remaining in the single market means accepting free movement of labour from the EU. 2. That, in any case, people coming to Britain is not a problem. The labour movement should reject the right-wing idea that it is, and champion unity of all workers to win better conditions and rights for all. We need an organised campaign to make these arguments, shift Labour’s position and finally make the labour movement a positive rather than a negative factor in the shifting patterns of the UK-EU negotiations. Corbyn does have a record of support for the Republican movement in Ireland (that is, not the IRA as such, but the nationalists fighting for a united Ireland), and he was long involved with the Stop the War Coalition, which did indeed oppose — sometimes, in Workers’ Liberty’s view, with terrible arguments — the major military interventions involving Britain since the Iraq war (Libya; Syria); the key forces within it including Corbyn, also opposed intervention in Kosova. But in both cases, while Corbyn’s own politics are influenced by a left-wing tradition of political “softness” towards noxious movements simply because they are at odds with “the West”, his record is probably more concretely connected to a desire to resolve conflicts through negotiation and diplomacy. (This is true, I think, even of his more controversial statements about, for instance, Hamas, the Palestinian Islamist movement). And this commitment to diplomatic solutions comes top of the Labour manifesto promises on foreign policy. “We will put conflict resolution and human rights at the heart of foreign policy, commit to working through the UN, end support for unilateral aggressive wars of intervention and back effective action to alleviate the refugee crisis,” it states, boldly. The Party also promises to address other conflicts — it mentions “Kashmir, Libya, Nigeria, Sudan, South Sudan, Somalia and Yemen.” Indeed on Yemen — where the Tory government has backed a brutal Saudi-led war, Labour demands “a comprehensive, independent, UN-led investigation into alleged violations of [human rights] in Yemen, including air strikes on civilians by the Saudi-led coalition. We will immediately suspend any further arms sales for use in the conflict until that investigation is concluded.” This would be a welcome change indeed in British foreign policy. A more comprehensive look at arms sales in general would have been more welcome still. Many such conflicts pose sharply perhaps the most vital issue facing Europe and the Western world — the refugee crisis, which is driven by wars and poverty and shows no sign of abating. On this, Labour is vague: “In the first 100 days of government, we will produce a cross-departmental strategy to meet our international obligations on the refugee crisis.” That is an improvement on the Tories’ utterly lamentable record. The commitment to “conflict resolution”, if it led to anything in practice, would be a part of any meaningful solution to the crisis. But only part. Immigration is at the heart of the political debate. The issue was clearly central in fact to the Brexit vote. It is the issue which, above all others, the Corbyn leadership finds it hardest to challenge mainstream prejudices. On one level this is hardly surprising — given the toxic stream of anti-immigrant propaganda delivered daily by so much of the media (the Daily Mail being an obvious example). If Labour took an unequivocal line supporting free movement it would be savagely attacked in the press — and many of its core voters, those who voted for Brexit and so forth, would prove hard to win over in the short term (certainly before the election). While Labour this time certainly avoids the idiotic pandering to these prejudices which marked the Miliband campaign in 2015, still it is backtracking from earlier, stronger statements. Labour is, of course, better than May’s Tories. But a general sense of good-will towards immigrants and migrants, and promises to “meet obligations”, do not equal a policy. And on defence policy, Labour’s current commitments are a very long way to the right of what might be expected from the Corbyn team. Labour will support Trident. More: “Conservative spending cuts have put Britain’s security at risk, shrinking the army to its smallest size since the Napoleonic wars”. Labour, by contrast, commits “to spending at least two per cent of GDP on defence [to] guarantee that our Armed Forces have the necessary capabilities to fulfil the full range of [their] obligations.” No doubt this reflects compromises with Labour’s pro-NATO right wing. There is certainly much to support in Labour’s manifesto commitments on foreign policy, but the broad sweep of it is pretty “mainstream” — multilateralist, favouring diplomacy over armed intervention, with some commitments to the rights of immigrants (whether from EU countries or refugees), but nothing hugely specific, and nothing which could be construed as particularly radical. It is, nonetheless, for sure, a step forward in comparison to the Blair years. NB: this article is from the AWL: anyone from the Socialist Party is welcome to send us a reply, which will be published on this site. At best, Hannah Sell’s article “Brexit and the left” (Socialism Today, the magazine of the Socialist Party, Issue 207, April 2017) is a series of platitudinous banalities. At worst, it is a wretched concession to nationalism. In a rare direct polemic against other group on the left (the Socialist Party prefer to plough their own sectarian furrow, acknowledging the existence of other tendencies only occasionally), Sell makes a number of claims about Workers’ Liberty which range from the distorted to the straightforwardly untrue. She accuses us of “having consistently argued that the EU is progressive”. This is not our position. The institutional infrastructure of the European Union, like all capitalist institutions, is a class instrument, constructed to enforce the rule of capital. But the continental integration it brings with it provides a higher platform for working-class solidarity and united struggle than the hard right’s alternative — a Europe of competing national-capitalist blocs, walled off behind high trade barriers and intensive immigration controls. That was the choice on offer in the 23 June referendum; that is why Workers’ Liberty was for “remain”. She next accuses us of having “no concept of the limits to capitalism’s ability to overcome the barrier of the nation state”. In fact, we have repeatedly cautioned against the view that capitalism has bypassed the nation state entirely, echoing the arguments of Ellen Meiksins Wood and others. Rather, nation states themselves “globalise” by making themselves attractive sites for international investment, and plugging into interconnected world markets. This globalising logic creates objective, material basis for a greater degree of working-class unity than “national” working classes struggling solely against “their own” ruling class, behind barriers and borders. Sell scoffs at the idea that capitalism might “carry through the task of the unification of Europe and that this would be ‘progressive”, apparently impervious to the reality of the degree of European integration and unification capitalism has already achieved. To repeat: the existence of a single market, and the erosion of borders throughout substantial parts of Europe, provide an objectively higher, better, basis for working-class unity than the vision preferred by the right, and apparently by the Socialist Party, of rigidly delineated national-capitalist blocs. For that process to be reversed under pressure from economic nationalism and xenophobic “sovereignism” — currently the only meaningfully hegemonic forces behind the drive to break up the EU —would certainly not be “progressive”. The article finishes by repeating the Socialist Party’s wretched position on immigration – that is, an unquestioning acceptance of the idea, which does not survive contact with evidence, that migrant labour straightforwardly depresses pay and conditions for domestic labour, and that the solution to this is to apply controls at the border. Migrant workers are as much part of our class as British workers. Our politics must be as much for them as for British workers. We must defend their rights – their rights to migrate freely and safely, free from the violence of border controls, and their right to legally seek work – as vociferously as we defend the wages, terms, and conditions of domestic labour. To adopt any other position necessarily implied that the rights of British workers come first, simply by dint of the fact that they are British. There is no other word for this but “nationalism”. Sell’s article says that “the only way to push back is for a united struggle of all workers”. Quite so. But in the context of what is essentially a polemic against a policy of free movement, and for restrictions on immigration, it is plain that, for the Socialist Party, “united struggle” is not the “only way to push back”; they also favour legislative mechanisms to restrict immigration. Sell cites the 2009 Lindsey oil refinery strike, where workers protested at bosses’ use of Italian migrant labour on terms that undermined collectively-negotiated agreements, as an example of the kind of struggle necessary. That strike began as a strike demanding “British jobs for British workers”. Undoubtedly the Socialist Party comrade involved did play an important role in shifting the dispute away from such racist slogans and onto politically healthier terrain. But those who, while supporting the Lindsey workers’ fight for national agreements to be respected, sounded a note of caution about the risk of viewing migrant workers as the enemy, were right to do so. Sell quotes Giorgio Cremaschi, leader of the Italian union Fiom, supporting the strike, but none of the Italian migrant workers themselves. Migrant workers’ agency is missing from the Socialist Party’s picture; the implication is that “united struggle” in fact means struggles by British workers against the way migrant labour is “used”. The fact remains that the Lindsey scenario is rare. There, a unionised domestic workforce, with collectively-negotiated national agreements, saw their employer physically bus in migrant workers and employ them on terms outside the existing agreements. This is not the basis on which any significant proportion of migrant labour comes to Britain – or, to use the Socialist Party’s schema in which migrants are passive instruments of neo-liberalism with no agency of their own, “is brought”. Ending free movement, which is the Socialist Party’s policy, would not do anything to meaningfully protect trade union agreements. It would, however, significantly disadvantage working-class people from EU countries attempting to move to make a better life for themselves and their families. 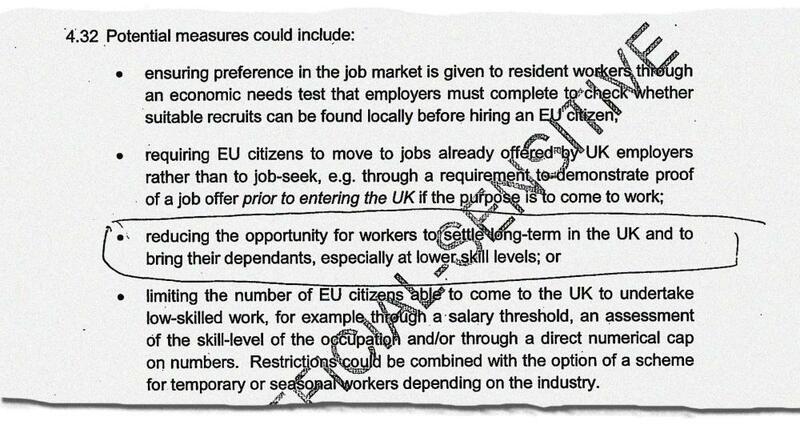 The Socialist Party give their pro-immigration controls position a labour-movement gloss by claiming that the “control” they favour is a kind of (presumably state-enforced) closed shop, whereby employers wishing to “recruit abroad” must be “covered by a proper trade union agreement or by sectoral collective bargaining”. But the vast majority of migrant labour does not consist of workers directly “recruited abroad”, but of workers who come to Britain, sometimes as a result of acute poverty and lack of opportunity in their countries of origin, looking for work. Does the Socialist Party propose to have border police checking union cards at Dover? Should we expect to see Socialist Party delegates at Britain’s airports and docks, telling migrant workers – the very people who, in previous generations, helped lay the foundations for our modern labour movement – that employers will use them to undercut British workers, and that the class conscious thing to do would be to get back on the plane or boat and go home? All workers – local and migrant – should be “covered by a proper trade union agreement or by sectoral collective bargaining”, but this will be imposed on employers through class struggle. To propose it as policy we want the existing state, with its Tory administration, to adopt as a fix for a perceived immigration “problem” is a political contortion undertaken by a tendency visibly uncomfortable with the implications of its own perspective. The Socialist Party should take some responsibility for the logic of its position. Be honest! Just say it, comrades: you think immigration depresses pay and conditions for domestic workers, and to solve this problem, you think there should be less immigration. That is the substance of your view. No amount of gloss, nor any amount of reassurances that you do not consider migrant workers to be at “fault”, as Sell puts it in the article, change that fundamental fact. Workers’ Liberty takes a different view. Our view is that no human being should be “illegal”. Our view is that the right to move freely, including to move between states, is a fundamental human right, and that restrictions on that right cannot be imposed except by state violence. Have employers sometimes attempted to “use” migrant labour to lower their costs? Of course — just as some employers historically exploited the entry of women into the workforce to drive down wages by paying them less than men. In proposing restrictions on immigration, however packaged and presented, the Socialist Party echo the Lassallean socialists of the 19th century who opposed women’s entry into the workforce on the basis that they would be “used” to undercut existing, male, workers’ wages. The free movement that exists between EU member states should be extended, not restricted. Bosses’ use of migrant labour to undercut local labour should be met with common struggle and demands for levelling up, not calls to end free movement. By arguing that the rights of British workers can be protected by restricting the rights of migrant workers, the Socialist Party give ground to nationalism.